Here at Genie we are firm believers in cleaning most rugs as wet as they can be cleaned. The oldest way of cleaning these rugs is to wash them, and wash them we do! View the video. First we inspect the rug with the owner (when possible) to get as much history as possible. What are the specific reasons for cleaning at this time? What is expected from the cleaning? Have any pets urinated on the rug, and so on? We like to know the age of the area rug and if it has ever been washed? If so, when and by whom? Second, we put the rugs through a dusting machine. This is a machine that has over a hundred leather straps that gently, but firmly, slap the back of the carpet as it is fed through. Third, we take the rugs to our pit area (a slightly sloping floor that has a drain at one end) where the rugs are thoroughly saturated with plenty of fresh water. Fourth, we scrub up the rugs with a lot of shampoos or soaps. The chemistry may vary on the type of rugs and dyes used. Think of wool for a moment. Take away the mystique that we often assign to Oriental rugs. It’s animal hair. Not that much different than our own hair. How do you clean your own hair? 1. Thoroughly wet hair. 2. Lather. 3. Rinse. 4. Repeat. It’s not rocket science, but there are scientific principles employed. We often lather, rinse, and repeat. Fifth, after we are satisfied that we have been able to remove all soils (most often front and back) from the rugs, we do a final rinse on the scrub pit floor. Sixth, we move the rugs to a machine for a final rinse and wring. 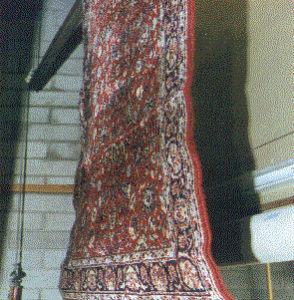 Seventh, the rugs are hung vertically from one end of the rug on special poles. The rugs easily dry in about 6-10 hours and are then lowered to the floor where they are given a final inspection, and then rolled and tied and stored while we arrange for delivery to your home.